Lycée Français de la Nouvelle-Orléans racked up $8,440 in legal fees over the course of one month — all for lawyers to respond to public records requests. The 340-student French language charter school turned to the Adams and Reese law firm earlier this year after struggling to comply with Louisiana open records law. Attorneys in January charged between $145 and $290 per hour for 38.3 hours of work they spent reviewing and responding to public records requests, according to a May invoice provided to The Lens. Though the firm also represented the school for a short time in a lawsuit involving a former employee, that work will be billed to Lycée’s insurance provider and was not reflected in the invoice. New Orleans law firm Jackson Lewis is now representing Lycée in the lawsuit. It’s an expensive proposition, and bad practice, for public agencies to rely on attorneys to facilitate compliance with public records law, says Mark Caramanica of Reporters Committee for Freedom of the Press. But a public records expert from Reporters Committee for Freedom of the Press says it’s an expensive proposition, and bad practice, for public agencies to facilitate compliance with public records law. “It seems like an outrageous policy that results in waste of taxpayer funds and undue delay,” said Mark Caramanica, freedom of information director for the organization. It’s not that Lycée school officials never answered public records requests on their own. In November, after $200,000 budget adjustment and sudden staff cuts, The Lens sought job descriptions, payroll records, professional service contracts and the school’s audit. Lycée board chairman Jean Montes responded the next day and set up a time for The Lens to view records. But on Dec. 12, when The Lens requested a copy of the resume for newly hired interim CEO Gisele Schexnider, no one responded for six weeks. Even after a Lens reporter handed Adams and Reese attorney Jaimmé Collins another copy of the public records request on Jan. 14, attorneys did not supply it until Jan. 25 — 44 days after the original request. Louisiana public records laws requires agencies to provide access to public records “immediately” if they are not “in active use.” If they are being used, the custodian must notify the applicant and set a viewing time within three business days. Public agencies in New Orleans often don’t comply with this provision, however. Despite the price Lycee was expected to pay for these legal services, much of the advice that the school received appeared to be problematic — in some cases even contradictory. Though Adams and Reese attorney Lee Reid said attorney-client privilege prohibits him from commenting on the specifics of the work detailed in the total $9,000 bill, some of the dates listed on the May 16 invoice coincide with requests The Lens made. On Jan. 15 and 16, attorneys billed Lycée $2,491 for 11 hours attorneys spent reviewing records requests and drafting responses. On those same days, records show, Schexnider was notified by Audubon Charter School that someone had filed a request for records involving Schexnider being banned from Audubon’s campus when she was the parent of a student there. Between January 24 and 29, the firm billed the school $4,001 for 18.8 hours they spent reviewing, analyzing, and responding to records requests. That included a 12-minute phone call between an attorney and a Lens reporter that cost Lycée $38. The time period coincides with The Lens’ inquiries about severance pay and termination paperwork after an audit revealed former Lycée CEO Jill Otis was paid almost $30,000 after she resigned. On Jan. 30, Collins sent an email to The Lens stating, among other things, “Jill Otis never received a severance package.” The attorney wrote the same was true of former CEO Jean-Jacque Grandiere. That same day, the school issued a press release that contradicted the law firm’s response. It stated that Grandiere had been paid for six weeks following his resignation. 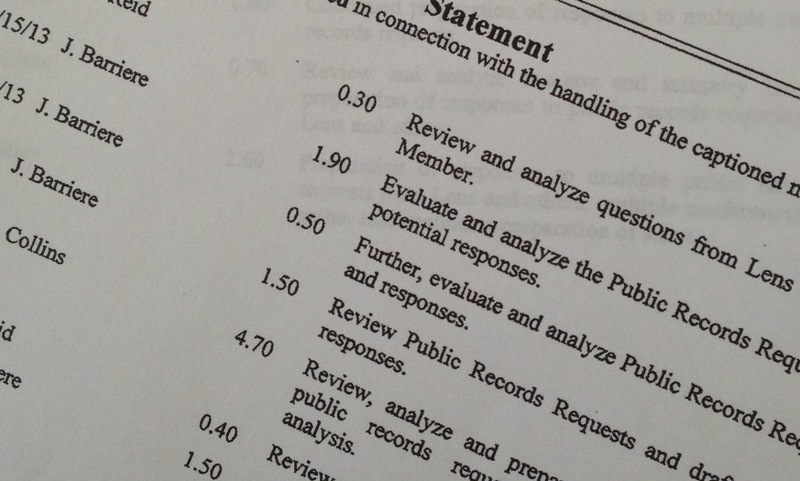 On Jan. 30 and 31, lawyers billed 7.7 hours for their work reviewing and analyzing requests, costing Lycée $1,745. Attorneys are hired to represent their clients’ interests, Caramanica said, and that doesn’t always align with the public interest. “The records custodian is supposed to be an advocate for the public,” he said. Caramanica advises public agencies not lean on attorneys to fulfill record requests. It’s understandable to occasionally run particularly complex requests by lawyers, he said, but the school should be able to handle most requests in-house. Robert Rachal, an attorney who represents a group of parents who have criticized the board’s leadership, said Adams and Reese’s work was essential. But he also hopes the school can reduce its legal costs in the future. “It was a necessary and useful expense to get them through a tough period,” said Robert Rachal, attorney for a group of Lycée parents. “It was a necessary and useful expense to get them through a tough period and to fix the problems they were having,” said Rachal, whose clients in January were particularly concerned about the board’s lack of transparency. Lycée’s board now includes three lawyers; it is common for charter schools to utilize board members’ professional skills. Reid continues to attend school board and committee meetings. He said the firm does pro bono work for the school, but it’s not clear what work has been for free. Leaders’ “atrocious handling of affairs made it necessary to retain the services of an expert attorney and we all know that expert attorneys don’t come cheap,” said Lycée parent Charles Varley. “His, other board members’ and administration’s atrocious handling of affairs made it necessary to retain the services of an expert attorney and we all know that expert attorneys don’t come cheap,” Varley said. Lycée finance director Julianne Ruocco said the school is already over budget in the area of consultant services, which includes attorneys fees. It has not received any bills from Adams and Reese past those for January services, she said. The school spent $105,991 of the budgeted $100,853 for consulting firms, including the legal bills, as of May 31. Besides legal work, that part of the budget also goes toward fundraising, development projects, school software and bank service charges. Despite that overspending, Ruocco said this week that she still projects Lycée’s budget will have an overall surplus when the fiscal year ends June 30.